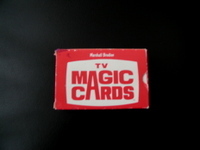 Marshall Brodien invented TV Magic Cards. Here's one of the over 17 million decks he sold during the 1960s and 70s. If you grew up in Chicago during that time period, then you probably know Brodien. Not only was he on TV constantly hawking his magical cards, but he also played Wizo the Magic Clown on WGN's popular kids TV show, Bozo's Circus. For those unfamiliar, Bozo Circus was a low-budget live-action TV show that aired weekdays during the lunch hour. The show was wildly popular with young children. And it was especially tough to get tickets to the daily live broadcast. I recall hearing tales of waiting lists stretching 20 years or more. In fact, I was able to attend a broadcast at the WGN studios because one of my uncle's friends finally received his tickets when he was in his early 20s. No one in his age group wanted to attend, so he took me (I was 5 at the time). I don't recall much about the show I saw live, although I seem to remember the TV cameras and the Bozo Band. It all seemed surreal. 2. The routinely complete and utter emotional breakdown of children who played the "toss the ball in the bucket" game (with wildly improving prize value with each farther and snaller bucket) - which no one ever won. Just go to Amazon and query "Svengali Deck". There are several cheap books that detail using this (Svengali Deck = TV Magic Cards)Deck.